Rating: Average 5.00 / 5 out of 1 total votes. Summary: Ayase Chihaya is a cheerful tomboy without any ambitious aspirations in life. 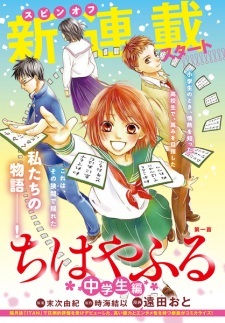 At school one day, she meets a boy named Wataya Arata who is an outcast at school. Feeling pity despite peer pressure, Chihaya befriends Arata as he reveals to her his aptitude in karuta which institutes Chihaya's dream to become a karuta queen.